Patches for the OS X and Linux versions are available here. Only editable in the VesselConfig.ini file, the setting SuperSample. Possible values are 1X, 2X, 4X, 8X and 16X. Due to a flaw in SDL video modes, Vessel for OS X requires that the settings be changed outside of Vessel. Edit ~/Library/Application Support/Vessel/VesselConfig.ini for this. 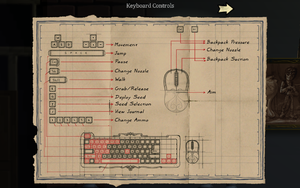 The keyboard/mouse layout for the game. To change the key bindings, edit VesselKeys.ini. Edit VesselGamepad.ini. See Controller remapping for OS X and Linux. If you've got a compiler handy, you can use this C file to determine your controller's config values. Note: Requires SDL headers/libs! The bindings that follow are named after the buttons found on the Xbox 360 controller. Simply bind the values described above to the equivalent 360 controller value. 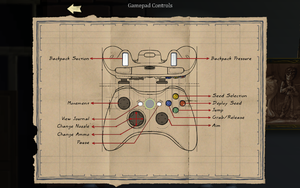 The full list of known configurations for various controllers (contributed by the community) can be found in the Files section. 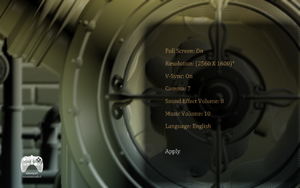 This bug only appears in the OS X and Linux versions of the game. The vessels are being filled, but the fluid isn't being displayed. The game works without problems in multi-monitor setups, however overviews, for example which reactors have been fixed in factory, will appear severely taller than the screen height. ↑ 1.0 1.1 File/folder structure within this directory reflects the path(s) listed for Windows and/or Steam game data (use Wine regedit to access Windows registry paths). Games with Steam Cloud support may store data in ~/.steam/steam/userdata/<user-id>/108500/ in addition to or instead of this directory. The app ID (108500) may differ in some cases. Treat backslashes as forward slashes. See the glossary page for details. This page was last edited on 15 April 2019, at 18:01.